We all know that Rural Real Estate people are masters in many spheres. Graeme Rogers is no exception. Growing up in the shadow of the mountain, he had school holiday jobs on various farms as a lad. But the construction industry beckoned, so Graeme spent the next 14 years as a builder, soon with his own company. 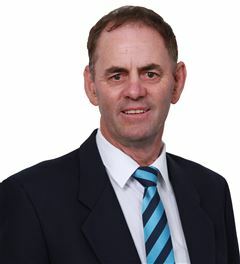 Since 1990 he has been selling Taranaki Rural Real Estate, becoming Wrightson's Manager before moving over to set up and manage then become part owner of Harcourts Bell Block. Graeme now resides at the main office (New Plymouth) to oversee the Rural/Lifestyle and Subdivision sector. Family, sport and now grandchildren are a big part in Graeme's life. Playing for NP Old Boys for 20 years and still playing squash for his Waitara Club. In their busy spare time, Graeme and Helen also farm a top finishing/ supplement unit at Brixton, proving that he really does know what he's doing in the farming world. Most of all Graeme enjoys being with people. He relates easily with an understanding of farming, building, rural & lifestyle properties, residential & rural subdivisions, management and business approaches. He is friendly and professional. He takes his Real Estate responsibilities seriously and pays attention to detail. Graeme always enjoys a challenge and doesn't give in.